A few weeks ago, I told my wife she should download Angry Birds HD for the iPad. She did, and I regret recommending it; I haven't seen the iPad since. Now I have to keep both my PlayStation Portable and PlayStation 3 away from her -- developer publisher Chillingo has announced that developer Rovio's Angry Birds is headed to the PlayStation Store as a PSP Mini game this fall. 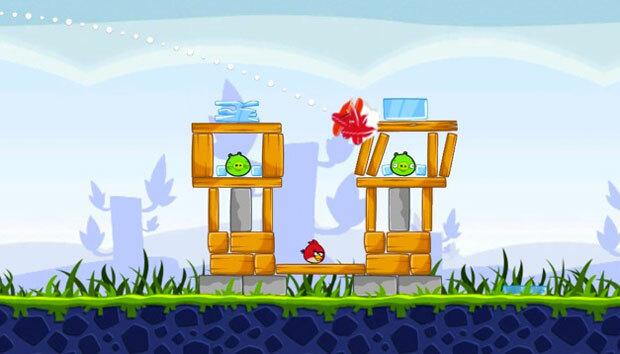 If you haven't played it, the game involves using a catapult to flick birds (angry ones, at that) into structures; the idea is to smash into green pigs who have stolen the irked birdies' eggs. The physics-based destruction is an absolute treat on both the iPad and the iPhone, and should conceivably translate well to Minis, because breaking stuff is fun on any platform. The Minis version will feature four worlds with over 120 levels, one of the worlds exclusive to Minis called "The Big Set Up." Also expect a new bird, "Big Brother," which can shell out "massive destruction." No word on pricing or even what Angry Birds will look like on Minis, but one can presume it'll be similar to the iDevice versions (seen above).